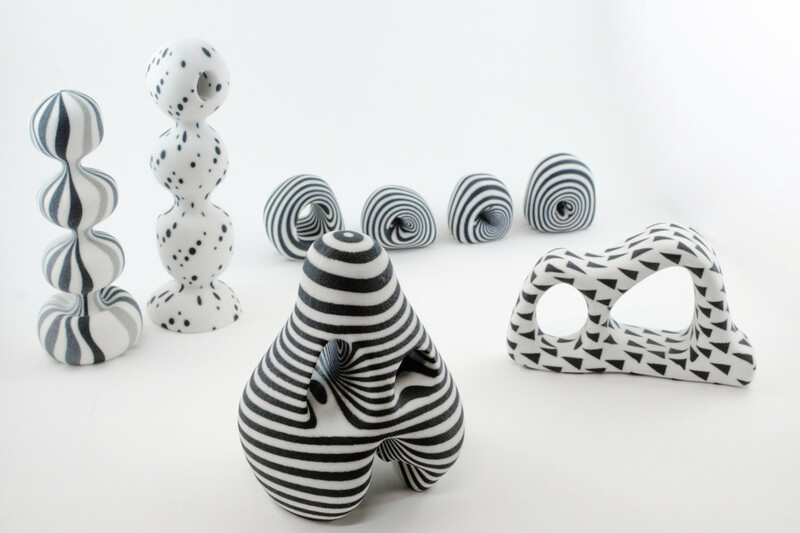 Did you know that there are different 3D printing processes? While they all build your model up layer by layer, the method they use to do so is different and leads to distinct characteristics in the final result. We offer Fused Deposition Modelling (FDM) and Selective Laser Sintering (SLS) processes, and this article is designed to help you decide which process is more suited for your needs. FDM 3D printers heat and extrude a plastic filament. SLS 3D printers fuse powdered material together using a laser. While both FDM and SLS printers build up your model layer by layer, the differences between their results stem from how they build these layers up. FDM printers feed a plastic filament through a heated nozzle to melt it, while the computer controls where this plastic is extruded. SLS printers lay a thin layer of powdered material over the entire working area, and the computer controls where the laser fuses the powder together in each layer. We offer PLA and ABS filaments for FDM printing. We offer nylon, alumide and full-colour sandstone for SLS printing. At Hot Pop we offer for use with FDM printers PLA (bio-degradable plastic) and ABS (oil-based plastic) filaments. For both, we stock black and white filaments with more colours on request. 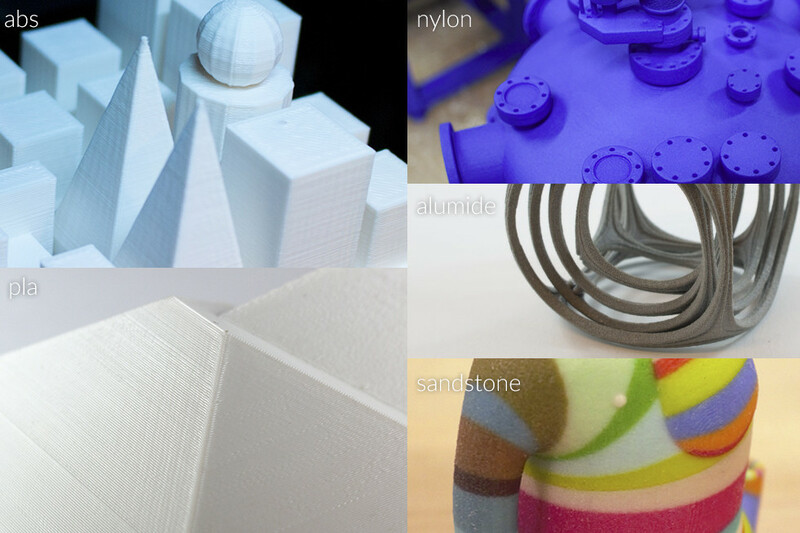 For SLS printers, we offer nylon, alumide and full-colour sandstone. Nylon prints can be dyed to many colours, but the whole model is one colour. Alumide powder is a mix of plastic and metal particles, resulting in a metallic product. Full-colour sandstone includes many colours in one model. For detailed descriptions and more images of each material, check out our in-depth 3D printing materials guide. Our FDM printers have a print size capacity up to 250 x 210 x 210mm, while the SLS printers can produce larger parts, up to 300mm x 300mm x 600mm. We offer FDM printing up to 250 x 210 x 210mm. (but we recommend staying within 300mm x 300mm x 300mm). FDM printers create simple shapes with good precision. SLS printers have less constraints and can produce elaborate geometries, fine details, even mechanical joints and interconnected parts. Since FDM printers need to extrude plastic on top of a heated platform, layer by layer, they have limits to their capabilities when it comes to overhangs and cantilevering forms shallower than 45 degrees. Some of these may be overcome by printing support structures that must be later manually removed. Additionally, FDM printers extrude material at a relatively course resolution, making fine details and thin wires difficult to achieve. SLS printers do not need to print support structures, as the unsintered powder remains in place to support later layers. This allows SLS printers to create the most complex parts, including intricate details, moving and interconnected parts. FDM printers have visible layers and steps. SLS printers have a more consistent matte finish. FDM printers are limited by the size of the extruding nozzle for their resolution, while SLS printers are limited by the much smaller radius of their laser beam. This means that projects made on SLS printers, when printed in the optimal orientation, have much subtler transitions between layers, making them suitable for final products. The cost of both processes depend on the model’s volume. 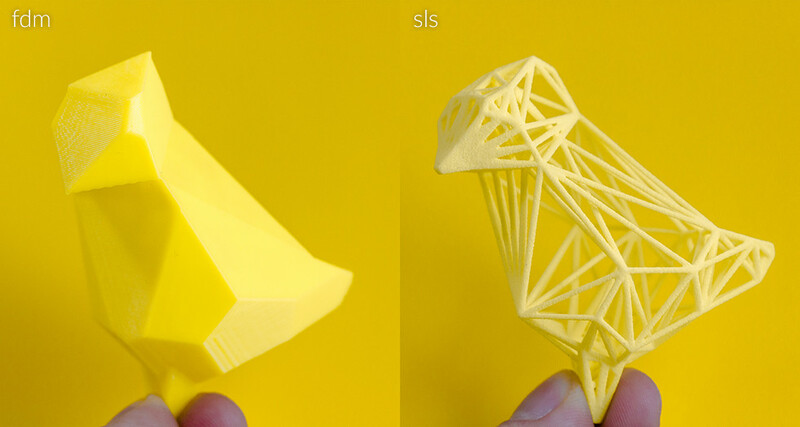 Typically, SLS 3D printing is more expensive and the difference in price increases as the size of the part increases. A large part of determining the cost of printing a model is the time it takes to produce, we call it “machine time”. This aspect of production is directly related to the model’s volume. Remember that the volume increases much faster than the linear dimensions do, as illustrated in the diagram. Therefore, when considering your project budget, be conscious of the fact that the overall volume of your 3D model will be the primary cost driver, even a small incremental decrease in size will have a big impact on reducing production cost. We offer turnaround for FDM prints from a rush 24 hour to standard 5 business days. 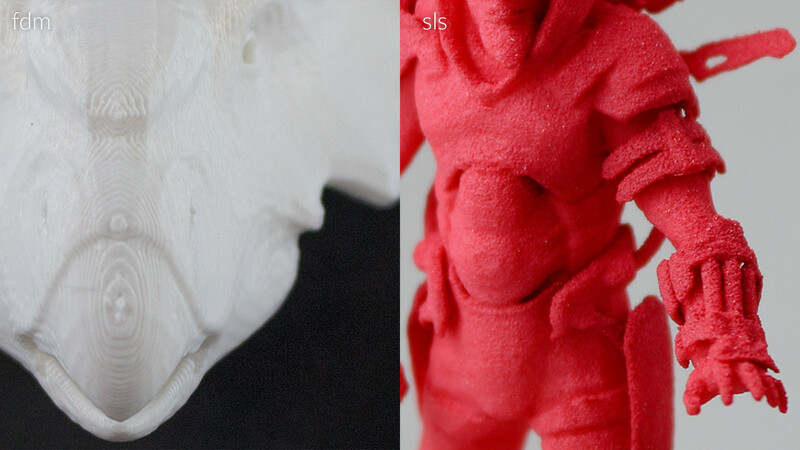 Turnaround for SLS prints in nylon and sandstone are about a week. Alumide can take up to a month to be completed. Now that you know the options we provide, go ahead and give us a shout what you want to make! PSST! We have a followup guide in the works that details the file requirements and design constraints each material. Signup for our newsletter to get notified when it’s published!